Sometimes, disaster really is the mother of invention. In this case, money got tight, really tight. I needed to avoid spending, any spending, for 10 days and so, the $20 spending challenge was born. As I talked about in The Dangers of Denial, my once successful online retail business took a serious downturn. The last 12 months have been witness to consistently decreasing income. Unfortunately, it took me a while to accept that the platform I was using was the problem and I needed to work on other options rather than continue to throw time, money and energy at a lost cause. Fast forward to today and the comfortable buffer in my mortgage (line of credit) and emergency fund are gone. For the first time in over 20 years, I am faced with the prospect of not being able to clear the balance on my credit card (which I use for all expenses) when it is due. It’s a real challenge for me to admit that. No more time for denial, only decisive action. So, with 10 days left before the end of the card’s billing cycle, I determined that I could spend only $20, which in addition to some small change, happened to be the cash in my wallet. There were still some business expenses that would need to go on the card, that was unavoidable, but nothing else would go on the card for the next 10 days. 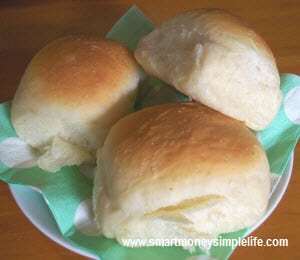 $20 Spending Challenge – Homemade oat bran dinner rolls, perfect with soup from the freezer. I’ve always maintained a well stocked pantry so the $20 spending challenge wasn’t as painful as it could have been. Maybe it’s a hold over from feudal (as opposed to just frugal) times and the need to be prepared for a siege? Whatever the reason, I feel more secure knowing the pantry is well stocked with all the usual staples. Additionally, my freezer was, well, not bursting with prepared meals, but there were several individual serves of main meals and soup plus some meat and frozen vegetables. The humans in the house were not going to starve but the felines’ pantry was getting low. A nice side bonus of needing to be creative in the kitchen, I found this wonderful recipe for Dorset Apple Tray Bake – simple to make and delicious. At the start of the 10 day spending challenge, I had roughly one quarter of a tank of petrol. I was sure I’d need to top up at some point which would take a huge chunk out of my budget – $10 doesn’t go far when fuel is $1.30 per litre (approx $5 per gallon). Usually, I use the car every week day to take orders to the post office but on the days that I had a lighter load, I chose to walk to the post office instead. It’s probably only a 2 mile round trip so not arduous by any means but a little challenging while carrying the orders. As a result of this spending challenge, I hardly used the car at all and got a lot of extra walks so no need to buy petrol. This experience has reinforced the importance of having the very practical insurance of a stockpile. Without it we wouldn’t have been able to get through those 10 days, let alone get through them with relative ease. It’s also highlighted that even though things are tough at the moment – it’s temporary. Unfortunately there are lots of folks out there for whom a spending challenge like this is what they call life. We’ll be on a bare bones budget for the next three months so I can make sure there’s nothing outstanding on the credit card and build up that buffer again. Luckily I have the ways and means available to do so. I’ll also be looking for ways to add a few extra dollars to the kitty, too. Realising I needed to tackle this spending challenge was scary but the lessons learned from it will continue to pay dividends long after that fear has faded from memory. Yes, Thomas, a challenge is a great way to flex those frugal muscles and push the comfort zone a bit. I’m hoping we’ll use this experience to make the grocery budget smaller and more efficient in the future. $20, ouch! We’re very tight at the moment too, but with not much hope of it changing for quite a while. I’ve shopped my pantry right down and we go through So. Much. Food. with a teenager, toddler, bub and a big hungry man in the house. Wow, your homemade rolls look seriously professional. : ) I’ve been toying with the idea of making my own homemade bread. Last weekend I made baguettes for as little as $.45 a loaf. Do you get cashback on your credit card? It’s a nice passive way to earn some side cash if you’re going to be using your credit card anyways. Oh! I nominated you for the Liebster Award. The info is over on my blog, and I hope you participate so we can learn more about you! Thank you, and thank you! I can’t take too much credit for the rolls, the yeast does all the work. They are definitely much cheaper and much, much nicer than the store bought version. I get good rewards on my credit card and cash them in for prepaid visa cards. I’ve just received a $250 prepaid visa which will cover groceries for the next month. I really need to “shop my pantry.” I have lots of side dishes and random food items. I need to dig it all out and figure out what I have/don’t have. Hopefully this week! Funny, I actually just made this bet with a friend. That he, couldn’t go through the week with only $20 to spend. He didn’t make it.. he didn’t have that well stocked pantry! 🙂 I want to try soon! It’s a great way to flex those frugal muscles!